This year, we are renaming the hugely popular Scoil social event (formally Dinner Dance / End of Year Party). We want YOU to help in this decision. We are giving the person with the winning suggestion a free ticket to the event, which takes place on January 20th @8pm in the main hall of Clontarf Castle. Submit your answers here by Nov 28th. The theme for the competition is 'Everybody's Invited'. A large motivation for the renaming is to give it a name which alludes to an event open to all friends of Scoil - playing / non-playing, members / parents of members, new & old friends - and so that we can continue to be one of the most well integrated Clubs in Dublin! A super end to the promotion playoffs on Sunday morning saw our hurlers take the glory after a dramatic last second goal. Trailing by 2 points with less than a minute to go, the final strike of the game saw center half forward,Barry Cushen blast the ball past no fewer than twelve Round Towers men to bury it deep in the back of the net ensuring that Scoil's dreams of returning to Senior hurling were alive and well. A big shout out to the huge Scoil support on the sideline who came out in their droves to support the lads on this momentous day. Take a look at the highlights from Sunday's promotion playoffs in this video filmed by Creative Design House - a short snapshot that captures the emotional roller-coaster of this unforgettable game. The hurlers have been hitting the headlines further afield since Sunday's win. Check out these Joe.ie articles of the match report itself , as well as our very own Danny Mottram and Barry Cushen making the team of the weekend. The 2017 AGM is fast approaching. All members and parents are encouraged to come along and have their say in how our club is run. The AGM will be held in the clubhouse on Thursday 30th November. Mick usually, although sometimes people just say "McCluskey", it's not that common a surname outside Ulster so that's probably why, there must be some very good looking people up there I suppose! Born in Dublin, grew up in Clontarf, currently residing in Kilmacud. My Dad, Tom, also played for the club. I played juvenile the whole way up, with massive credit to two men in particular, Patsy O'Keefe and Brendan Cahill who looked after our age group(1992), before remaining as a dual player at adult level. Hand passing the ball over the bar, and bouncing the sliotar to the ground during open play and running! Maybe knowing everyone's birthdays as well. On a personal level, probably winning young player of the year in 2012, because there was a lot of competition for the award that year. I have a BA from UCD, and have since been working on the campus. I played a high level of chess when I was a teenager, I still play sometimes. I also follow soccer religiously. If you could make one addition to Scoil in any way what would it be? A machine in the clubhouse to make cappuccinos, lattes, etc. The hurling wall in the corner with loads of people inside it on a cold January night. Division one in football and hurling, senior championship contenders in football and hurling. The Under 8s pictured above being presented with their very own commemorative book 'My First Team' after their final match of the season. Many thanks to Tommy Naughton who took the time ahead of the crucial AHL3 playoff to present these special books to the team. A big shout out to the coaches for organising such a lovely memento. The Under 10s pictured at their end of year outing in Jumpzone where they celebrated Adam's 10th birthday with a very special cake. There will be a junior trad session in the Clubhouse on Friday 1st December from 7 until 8. All welcome. Please note that this is not a supervised event and parents must be in attendance. If you're interested in getting your hands on some of Scoil's new Adidas gear, please register your interest through this link. Order and prices are dependent on numbers. Juvenile registrations are now due and can be paid online by following this link. The newsletter will be taking a short break during the month of December. We will be returning in January to continue bringing you a weekly news update from around the club. Under 10s girls take on St. Finians in Saturday morning blitz. Our Nursery section are taking a well deserved break until the new year.Training will resume in January. All newcomers are welcome. Scoil won this promotion play-off final played in Clondalkin by the narrowest of margins. In a tight and tense match, during which the teams were level on three occasions, Scoil won it with a goal from a free with the last puck of the game. Scoil’s supporters arrived at the pitch on Monastery Road in large numbers. Previously in the past five years the hurlers have been involved in play-off games to get promoted from both Division 5 and Division 4 so the Scoil contingent were both excited and expectant. The tone for the match was set from the start as players from both sides challenged zealously for every ball. Towers opened the scoring with a point and quickly followed that with another. Towers then created a clear goal scoring opportunity but they were thwarted by a fine save from Danny Mottram. A point from the resultant ’65 stretched the lead to 3 points. At the other end Scoil eventually got into gear. Robbie Kennedy won a great ball, beat his man and put over a fine score from about 30 yards on the left wing. This was followed quickly by an equally fine point from Michael McCluskey who was hoping to emulate his performance of the previous week when he scored 5 magnificent points from play. Ruairí Coady then showed his skill and mettle by winning a loose ball and driving at the centre of the Towers defence. It took a foul, for which the Towers defender got a yellow card, to stop him and Barry Cushen scored the resultant free to level the game. Towers had the better of the remainder of the first half. Four unanswered points gave them a 7 - 4 advantage at half time. The gap could have been wider but for another fine save from Danny Mottram and a marvellous block with his helmet by Conor Coady. The second half started with the same vigour as the first. However, it became noticeable that some personal duels that were being edged by Towers players in the opening half now seemed to be falling in Scoil’s favour. Our backs, with Alan Cronin and Eoin O’Carroll to the fore and Eoin Kennedy who was relishing the physical challenges thrown down by Towers were a lot tighter after the break. Podge Naughton and Alistair Cassidy were getting on more ball around the middle and as a consequence our forwards were getting more into the game. Points from frees and from play by Barry Cushen brought us level at 7 points each only for Towers to sneak ahead again by 8 – 7. Barry levelled the game again only for Towers once more to go ahead by 9 points to 8. Andy Bunyan then won a long ball, he dummied to hit it on one side before turning onto his other side and scored the equaliser. It was now 9 points apiece with about 6 minutes left and the tension had really mounted. A couple of scoring opportunities were missed at both ends as the pressure began to tell. Towers edged ahead by two points, one from a free which the majority of the Scoil contingent considered very harsh on the Scoil defence and they looked winners as the 60 minutes was up. Podge Kinsella received a pass between the Towers ‘50’ and ‘70’ and set off towards goal. He was fouled about 25 yards out as he was gunning for goal. The match was in the second minute of ‘time added on’ when Barry Cushen hit his free low and hard at the Towers goal. Much to the joy of the Scoil players and supporters the ball arrowed its way into the bottom corner of the net. The referee blew his whistle to signal that the game was over. 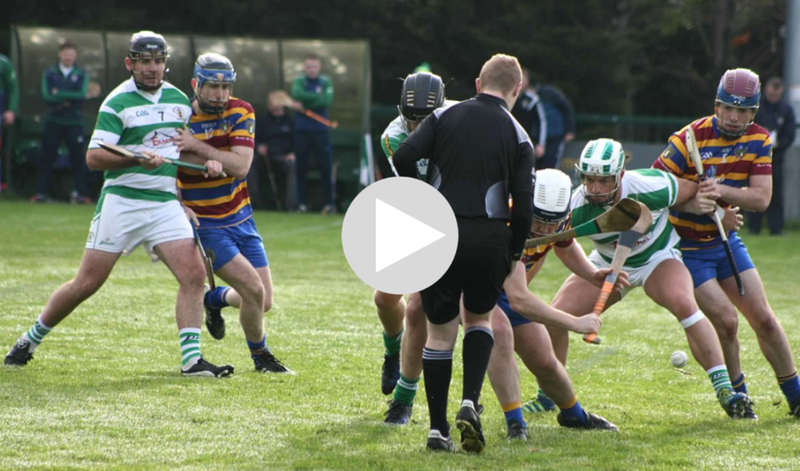 Scoil were ahead for the first and only time in the game – the match was won – and promotion to Division 2 had been achieved. We were asked if we wanted to play in a blitz against Fingallians last Saturday afternoon in Swords so we jumped at the chance as they were a step up from what we had played before. The girls were as is the norm slow to get into their stride and went 2 scores down in the first half against a big and strong side. However when we settled into the game and began to win dirty ball in the backs and middle third we could then impose our football and got back level at half time. After a few “strong” words of encouragement they blazed into the second half and despite kicking numerous wides ended up winning by a goal and a point in a very tight game. In the second match they got stuck in straight away and in possession looked a great unit with free flowing football and easy handpassed points been scored. We became complacent and allowed them back in so again at half time some discussions were needed to let the girls know that hard word brings rewards. Also, that you need to earn the right to get possession and that other teams like these that are used to winning themselves wouldn’t allow us to cruise through. The second half again was a better showing and with our backs again providing a strong performance to nullify their attacks and launch our own we ran out winners by 3 scores. The highlight for me was a diving block made by one of the team who picked herself up and won the loose ball before pointing it herself. That for me is the spirit these girls bring to the table week in week out. Scoil u8s played their final matches of the year last Saturday against Craobh Chiaráin. Each player was also presented with a momento of their first ever team in the form of a team yearbook. On the pitch, the kids put in superb performances to cap the year off in style. Having, by necessity, spent much of the year at training sessions drilling them on the fundamental skills of the game, we changed the emphasis in the past couple of weeks to include more movement and match-play. The fruits of this were apparent on Saturday as we saw some wonderful passages of play from the kids. In particular, their team ethic was evident as they all trusted one another with passes and worked hard for each other. Some of the movement off the ball in particular was fantastic to see, where players identified when and where to find space. Likewise, some of the passes that were spotted were beyond their years. There will be tougher tests in the future, but they passed today’s test in style. While there were some great individual performances and some players who showed their skills have come on in leaps and bounds, today was all about teamwork and not a day to single out individuals. After the matches, the kids and parents gathered in the bar. There, Tommy Naughton, met the team exactly 24 hours before his AHL3 hurlers would line out against Round Towers in the league promotion play-off. The suspicion was that he was looking out for talent that might be coming through if they were to lose! Tommy had a few words of encouragement and wisdom for the kids and presented them with a yearbook entitled “My First Team”.